OUR MEMBER LOAN CAMPAIGN IS UNDERWAY! Follow our progress on Facebook. Join today to participate in bringing the Food Co-op to life! We will be a community-owned grocery store in Fredericksburg VA focused on local foods, natural and organic products and sustainable practices -- more than just another place to shop. 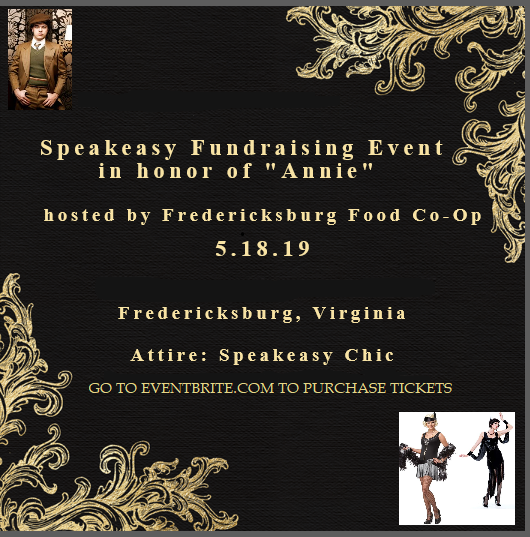 A Night at the Speakeasy - May 18 - Buy Tickets Today! See more events on our monthly calendar. The Fredericksburg Food Co-op will be a full service member-owned grocery store. We need members like you to help get started! Together we will improve access to healthy foods while enhancing the quality of life in our community. Member-owners will also receive many benefits. Whether you are a member or not we can use your help! Let us know if you are interested in volunteering. Member loans allow you to invest in your community while providing the capital needed to open our store. The Fredericksburg Food Co-op will be a full service member-owned grocery store. Our focus will be on locally grown and locally sourced products. We will offer a great selection of organic and natural foods and household products. As a member-owned cooperative, we will make decisions to maximize service to our members and our community. Our vision is to be a place to shop as well as a gathering place for people and ideas. We aim to implement the most environmentally sustainable practices in all aspects of our operation and to join others in working toward positive environmental goals for our community. We will collaborate with other businesses and entities in our community and will put a special focus on sharing best practices on nutrition, wellness, and the benefits of moving toward a more plant-based diet. Our success relies on the broad support of both our member-owners and the community. Please consider becoming a member today!